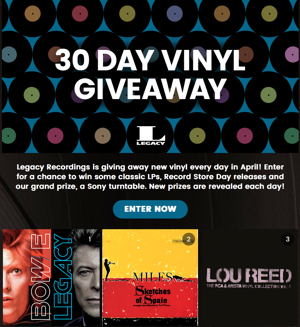 Sony Music’s Legacy Recordings launched its “30 Day Vinyl Giveaway” campaign creating a new kind of symbiotic relationship between brands and consumers. Sony is giving fans exactly what they want — sophisticated album choices, exclusive deals, and a community based around music — and in exchange, the brand is redefining traditional advertising. Throughout the month of April, the 30 Day Vinyl Giveaway reveals a new vinyl album daily, and consumers can enter for a chance to win. Created using the Wyng Countdown Calendar template, this campaign employs unique design elements such as a daily album cover reveal and related trivia and facts to break through consumers’ cluttered inboxes and capture their attention. “We're constantly seeking to connect music fans with artists and albums that resonate,” said Adam Block, President, Legacy Recordings. “In partnering with Wyng, we've created an engaging campaign that excites music lovers, and allows us to gain insights into their musical tastes and preferences that will directly inform our curation for them moving forward." Legacy's 30-Day Vinyl Giveaway signals a new dynamic in digital marketing. By giving consumers what they want — quality records and a community to compliment them — the brand gets what it wants: data to even better curate its choices. Instead of blasting consumers with digital ads, Sony has created a relationship with their consumers built on mutual affection. Read the full press release announcing Sony Music’s Legacy Recordings work with Wyng HERE.